As part of the change, the company that used to be called Google going to become a new holding company called Alphabet. Shareholders will get one Alphabet share for every Google share they previously owned. The executives in charge of Alphabet will be the same execs in charge of Google today CEO Larry Page, President Sergey Brin, Executive Chairman Eric Schmidt, CFO Ruth Porat, and chief counsel David Drummond. Later this year, Google intends to implement a holding company reorganization (the 'Alphabet Merger'), which will result in Alphabet owning all of the capital stock of Google. Alphabet will initially be a direct, wholly owned subsidiary of Google. Pursuant to the Alphabet Merger, a newly formed entity ('Merger Sub'), a direct, wholly owned subsidiary of Alphabet and an indirect, wholly owned subsidiary of Google, will merge with and into Google, with Google surviving as a direct, wholly owned subsidiary of Alphabet. Each share of each class of Google stock issued and outstanding immediately prior to the Alphabet Merger will automatically convert into an equivalent corresponding share of Alphabet stock, having the same designations, rights, powers and preferences and the qualifications, limitations and restrictions as the corresponding share of Google stock being converted. 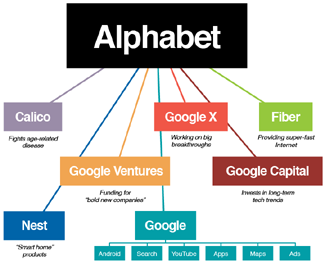 Why the new company is called Alphabet? It looks like neither Google nor Alphabet own alphabet.com - BMW does. Alphabet is part of the BMW group and a business mobility solution with a focus on fleet management and financing. Alphabet was founded in 1997, so it's unlikely that the company will give up its long-established domain name.